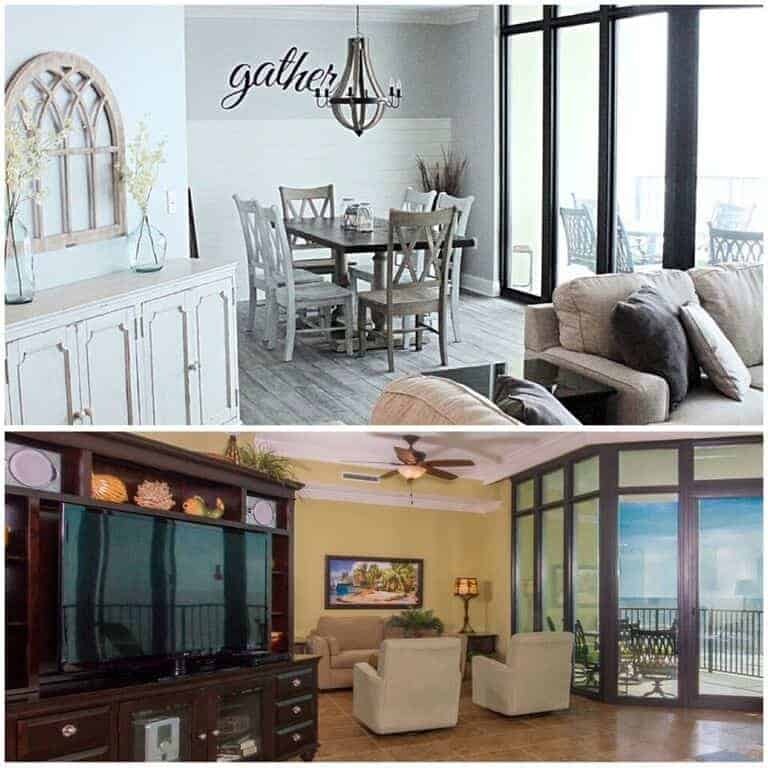 Has anyone noticed that home styles and trends change about every 10 years? We bought our first home about 12 years ago, and I decorated it with the bold reds and greens and the big dark furniture. After we had been in that home about 5 years, trends changed as did my style :). I started to update the decor, but on a very small budget. 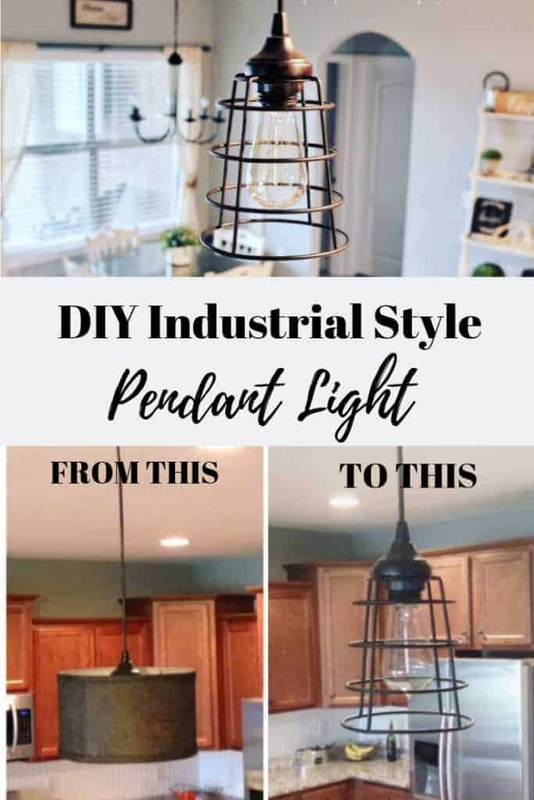 One recent project that I’m super excited about is my new DIY INDUSTRIAL FARMHOUSE STYLE PENDANT LIGHT! 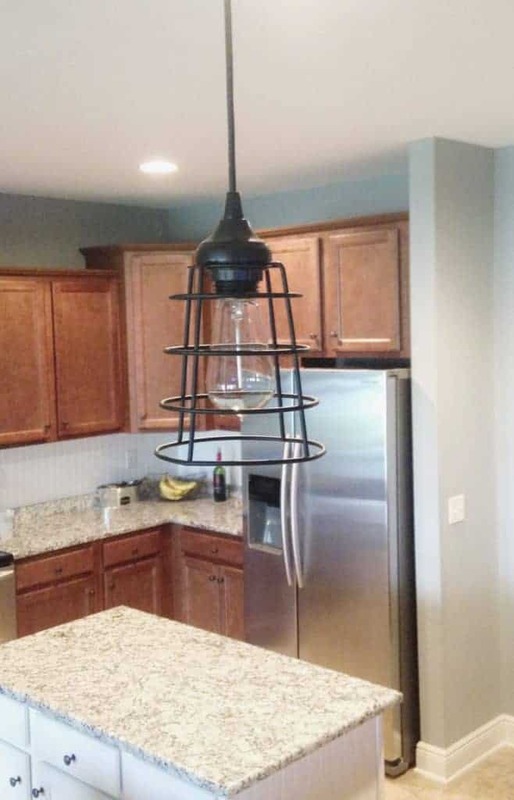 I’ve seen a lot of pictures of new industrial farmhouse style pendant lights that I had to have. It doesn’t look terrible, but since my new decor style is more a MODERN FARMHOUSE STYLE, I knew it would look a lot better if I replaced the shade with a more modern light cover. I knew there had to be a easy and budget friendly way to change out the lamp shade with a more industrial looking cage or shade. I headed to Pinterest for more inspiration. 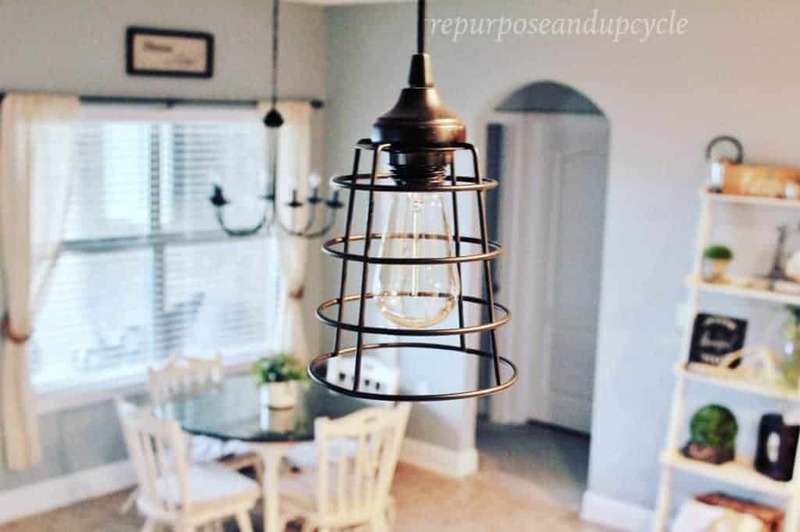 I saw someone who had turned a old pendant light into a farmhouse style pendant light with a metal lamp guard! 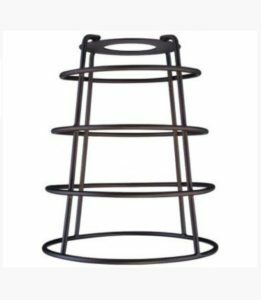 I went on the hunt for a similar Metal Lamp Guard at my local Lowe’s and Home Depot, but no luck. 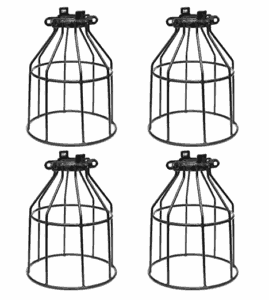 They seemed to have every lamp guard you could imagine, but not the perfect one I was looking for. Disclosure; this post contains affiliate links. If you purchase from one of these links I will receive a small commission but rest assured that you won’t pay any more for the product. Thank you for supporting my blog! I started searching the Internet, and I found the perfect PENDANT COVERING on a website called Life and Home. Best part, it was only $10!! You can see a very similar product (4 pack) that I’ve shared below from Amazon. I removed my old lamp shade and I noticed the silver part that the light actually screws into would stick out like a sore thumb if I left it “as is.” I decided to spray paint it oil rubbed bronze to match the new pendant lamp cage. After the spray paint dried, I screwed the new pendant lamp cage on the existing light. I then added an edison style light bulb ( this is totally not necessary but I thought it added to the INDUSTRIAL FARMHOUSE STYLE PENDANT LIGHT that I was trying to achieve). Now I had a new INDUSTRIAL style PENDANT LIGHT! I love the way it turned out! 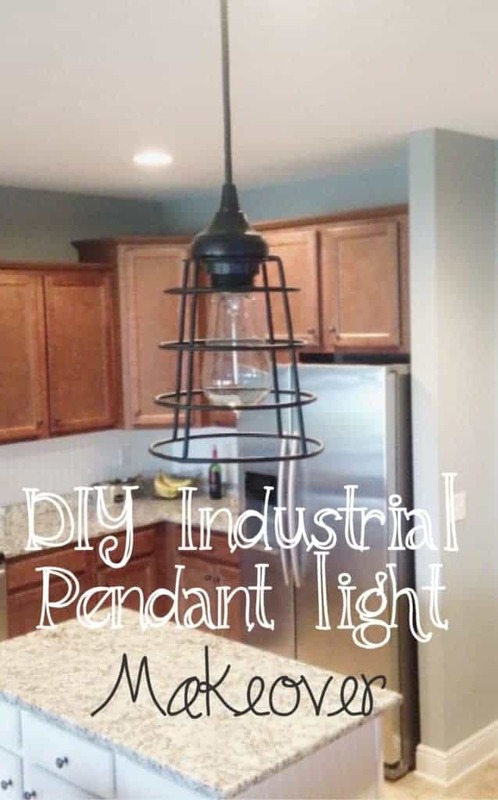 For very little money and time, I was able to change the entire style of this light and make it the perfect DIY Industrial Farmhouse Pendant light. To see more budget friendly projects like this, check out my other Home Projects. Below is an updated view of my kitchen since I’ve painted my laminate cabinets. 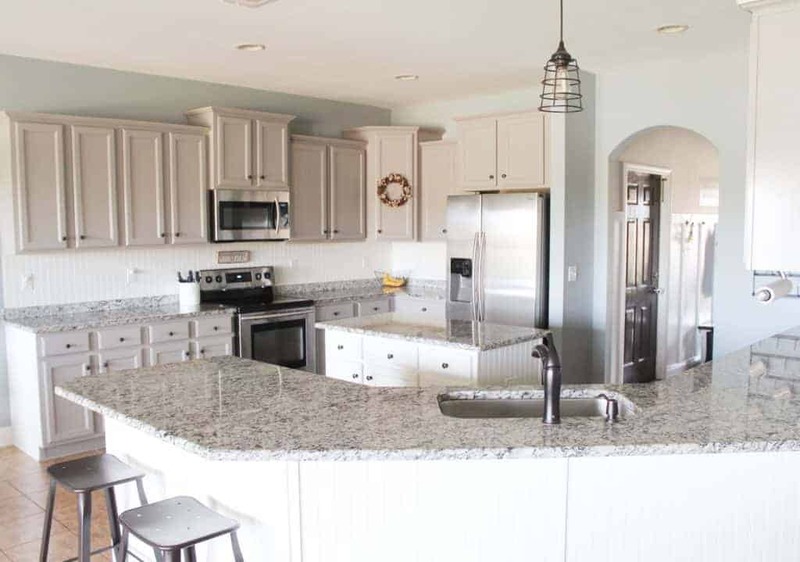 If you want to see more details on this entire kitchen renovation on a major budget click HERE. Great makeover. I’m working on lights at my house too. I’ll be checking online for parts after seeing what you found. I believe that the simplest way is the best. Love your makeover. 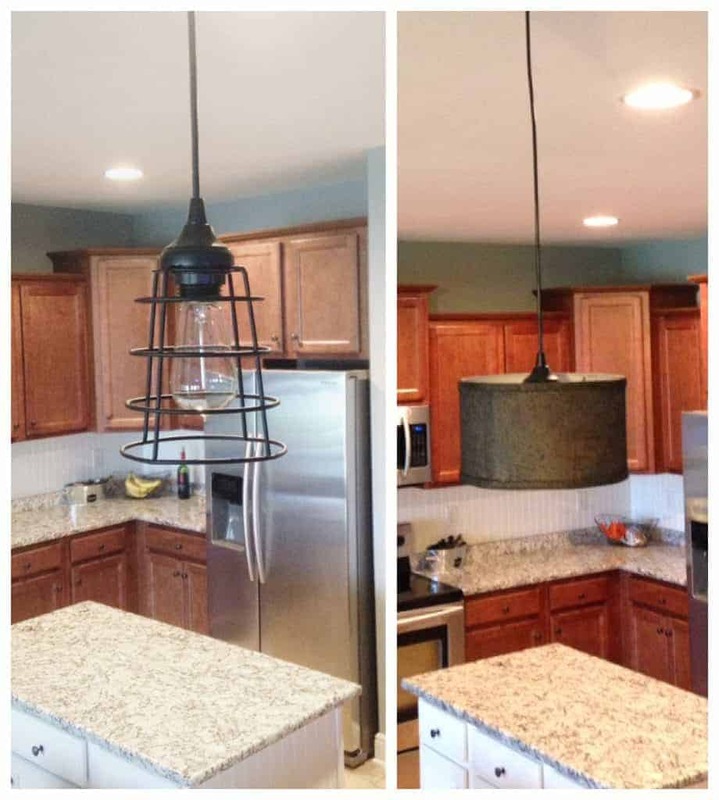 Your industrial farmhouse pendant light looks terrific. Very ingenious way of making something expensive looking for pennies! Sooooo….this is awesome!!! I have a spot in my house where I could totally do this same thing! I agree, so much can change in ten years or so….what a simple and affordable fix! Oh and BTW – your kitchen looks ahhhh-mazing!!! It probably took you much longer to search out the lampshade then to update the lamp. Congratulations on your find, finding the perfect fit isn’t always easy but it looks great. Love the new fresh open look. What an awesome find! I love the new look of your pendant. Now, if only I had the ability to put pendants above my island instead of a pot rack ???? Thanks so much for sharing at the #happynowlinkup! I love anything farmhouse style 🙂 Awesome idea! Best $9.00 ever spent! Love it! Love your makeover and the light is gorgeous! Thank you for sharing with us this week at Celebrate Your Story and we hope you will join us again next week. Your whole kitchen is beautiful. And I love your new pendant lamp! It makes such a difference! Love the new lighting. Thanks for sharing at this week’s party @DearCreatives Pinned & shared. Very nice, it looks great! I saw your post linked at BLOGGER’S PIT STOP 87. Saved it on Pinterest. Your new farmhouse pendant looks great! You’ve got a really pretty kitchen. Thank you! I’m very pleased with how it turned out too. How clever to switch it out like that. And what a great deal you got. Fantastic miake over. Thank you! Cheap and easy DIY’s are my favorite. Cute project! This light was very easy to make and look beautiful in my room. 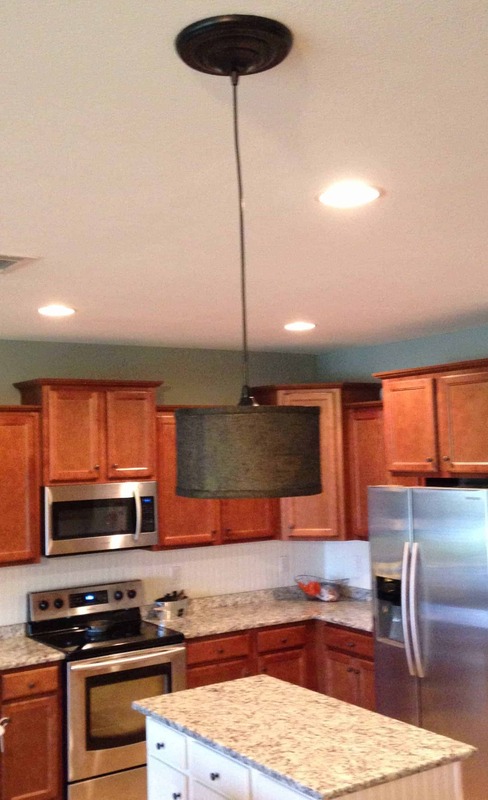 Pendant lighting can add a great visual styles. I am totally inspired with your work. Thanks for sharing.